(MusiqQueen.com/McDonald’s USA) McDonald’s USA today announced its Inspiration Celebration Gospel Tour is back and better than ever with some of gospel music’s biggest acts. Hosting the tour this year is one-half of sister duo Mary Mary and now solo artist Erica Campbell and comedian Jonathan Slocumb. Joining them will be three-time 2014 Stellar Award-winners Anthony Brown & Group TherAPy, the renowned Mississippi Mass Choir, gospel’s latest hip-hop sensation Uncle Reece, organist Moses Tyson, Jr. and the incomparable Kurt Carr & The Kurt Carr Singers. Back for its eighth year, the free summer concert series sets out May 22 and runs through July 25 to deliver messages of hope and inspiration to communities nationwide. 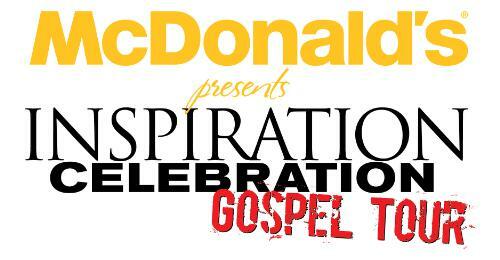 McDonald’s Inspiration Celebration Gospel Tour will again focus on the importance of giving back to the community by supporting Ronald McDonald House Charities (RMHC), the company’s Mission Partner. In recognition of the RMHC’s 40 years of keeping families together and helping children heal, this year concertgoers will have the opportunity to learn about the Charity and the important role it plays in helping thousands of children and families heal and thrive better together. Attendees will also be encouraged to support their local RMHC Chapter by participating in a love offering to help neighboring families served by the Charity. All Inspiration Celebration Gospel Tour concerts are free of charge. Gospel music fans can visit www.365Black.com to obtain tickets. The multi-city tour will make stops in 12 markets, including: Atlanta, Charlotte, Chicago, Detroit, Greensboro, Jackson, Los Angeles, Memphis, Oakland, Philadelphia, Raleigh and Washington, D.C.
*Only Erica Campbell and Anthony Brown & Group TherAPy will perform. McDonald’s Inspiration Celebration Gospel Tour is an extension of the brand’s 365Black platform, an initiative that celebrates the pride, heritage and achievements of African-Americans year round. To learn more about the tour and the 365Black initiative, visit http://www.365Black.com. Follow @McDonalds on Twitter for tour updates and join the conversation at #365BlackGospel. McDonald’s USA, LLC, serves a variety of menu options made with quality ingredients to more than 27 million customers every day. Nearly 90 percent of McDonald’s 14,000 U.S. restaurants are independently owned and operated by businessmen and women. Customers can now log online for free at approximately 11,500 participating Wi-Fi enabled McDonald’s U.S. restaurants. For more information, visit http://www.mcdonalds.com, or follow us on Twitter @McDonalds and Facebook http://www.facebook.com/mcdonalds. To learn more about the 365Black initiative, visit http://www.365Black.com. Ronald McDonald House Charities® (RMHC®), a non-profit, 501 (c) (3) corporation, creates, finds and supports programs that directly improve the health and wellbeing of children. Through its global network of local Chapters in 58 countries and regions, its three core programs, the Ronald McDonald House®, Ronald McDonald Family Room® and Ronald McDonald Care Mobile®, and millions of dollars in grants to support children’s programs worldwide, RMHC provides stability and resources to families so they can get and keep their children healthy and happy. All RMHC-operated and supported programs provide access to quality health care and give children and families the time they need together to heal faster and cope better. For more information, visit http://www.rmhc.org, follow RMHC on Twitter (@RMHC) or like RMHC on Facebook (http://www.Facebook.com/RMHC Global).